In this video, we are moving back to the most beautiful era of the German State Railroads. Back in the 1980’s when there were still some steam locomotives and a lot of diesel locomotives in operation. Our journey begins in a locomotive shed with a turntable. We accompany model trains with a gliding camera during the ride. We also see some funny and frivolous scenes in this model landscape. In this miniature world there is no train station, but there is a scrap yard. There are everyday scenes, somewhere in the neighborhood, and a motorway, where an accident happened, and much more. Again and again, the large locomotive shed is the focus of this video, because we see a lot of well-known German locomotives there. 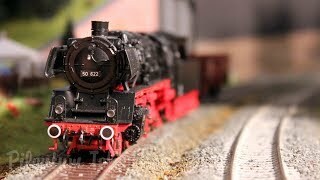 Enjoy 38 minutes of model railroading in Germany.